Ama Dablam (6812 m, 22494 ft) is one of the beautiful peak also known as the Matterhorn of Nepal located at Khumbu valley of the Everest region. The path to Ama Dablam peak is through the popular and easy route via the southwest ridge. Mount Ama Dablam was first ascended by Mike Gill (NZ), Barry Bishop (USA), Mike Ward (UK) and Wally Romanes (NZ) in March 13, 1961 through the southwest ridge. From the top of the Ama Dablam, you will be delighted with the spectacular views of Mount Everest (8848 m), Lhotse (8516 m), Makalu (8485 m), Cho Oyu (8188 m), Imja Tse or Island Peak (6189 m) and several other snowcapped peaks. This trekking tour begins from sightseeing some of the heritage site of Kathmandu. Next we fly to Lukla viewing the top views of the Himalayas. After reaching Lukla, we will do a short hike to Phakding to acclimatize. The following day, we begin our trek following the DudhKoshi River through the pine forest and reach NamcheBazar where Sherpa communities reside. We continue our trek further for few days crossing some of the main routes of the Everest region such as Debuche, Pheriche and take break for a day to acclimatize. Next we reach at the Ama Dablam Base Camp and stay overnight. And next we will be preparing for the summit for the following day. Next we will be summiting this exquisite peak of the Everest region and after summiting the peak, we will retrace back to the base camp following the same path we came from and after reaching Lukla, we fly back to Kathmandu. This 15 days journey has been carefully arranged by our professional climbing guides focusing the client’s safety for each day - acclimatizing the altitude to successfully ascend the peak. The best time for this expedition will be on the month from October to January as the weather is nearly perfect and will be easy to accomplish ascend this peak. 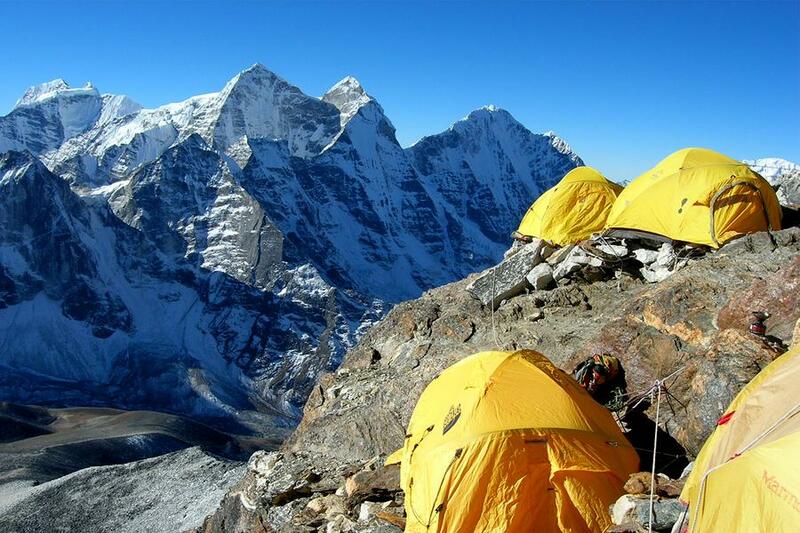 If you have any enquiry relating to this Ama Dablam Expedition, please do contact or email us. As you arrive at Tribhuwan International Airport, Kathmandu Nepal, our representative, standing and waiting for your reception, pick up you and drop to the hotel. In the evening Accent Himalaya invites you for welcome dinner. You get a chance to experience the delicious Nepali Cuisine which makes you the wetness of the traditional and cultural Nepal. Hindus most religious/pilgrimage temple of Lord Shiva where millions of pilgrim visited every year. The special days of lots of crowd in the temple are Mahashivaratri, Hindus festival Teej, and many other days and every Monday. Worlds’ largest Stupa; Boudhanath was completely destroyed in the earthquake of April 2015 and now it is completely reconstituted and reconstructed in now it is the most attraction for visitors in Kathmandu. It catches the wonderful history of Kathmandu and its kingdom and leaders of the valley. Kathmandu Durbar square is full of history and arts of the Newari communities. The wonderful architecture and the arts are so impressive. The sculpture in the area crafted without using any modern equipment in wood and stone is world’s most impressive. Early in the morning after having our breakfast with sunrise, we have to drive to TIA domestic terminal and take a flight to Lukla with a wonderfully scenic route through the magnificent vision of snow covered mountains and peaks, diagrammatic landscape with green forest and level farm field. After arriving at Tenzing-Hillary Airport, Lukla, where we meet with our crew members and begin to trek heading for Phakding where we stay for the night. In cold morning air, we take our breakfast and continue to trek heading to Namche Bazaar. We follow the trails passes through the pine forests then walk alongside the Dudhkoshi River. After taking few more steps, we begin to see the glimpse of Mt. Thamserku (6,608m) on the right of our trails. We further trek through the lush, pine, fir and juniper forests and also cross the suspension bridges severally then finally we point to Namche Bazaar. Today we spend enough time for rest and acclimatization. Expert advice to take enough rest while trekking to high altitude but also advice to hike and walk around the area for much better acclimatization. So, there is some option set aside for this day, we either stroll around Namche bazaar’s villages or come in touch with Sherpa people and their rich culture, even we have the option to hike up to the Everest View Point Hotel and enjoy the close-up views of mighty Everest. While at Namche bazaar or upon returning from hiking, trekkers may also visit the Hillary Museum storing exhibits displaying the area’s native flora and fauna and the history of Everest and Khumbu region. We have also option to make the little longer hike to Khumjung Village about of 5-6 hours where we can visit the Edmund Hillary school and Khumjung Monastery that famous for housing the Yeti’s head !!! We have to trek further along the Everest route and pass through beautiful villages and cross the River Dudh Koshi with enjoying magnificent views of the Himalayan and peaks including Everest, Lhotse, Nuptse, Ama Dablam and so many others all on the way. With ascending over the steep trails, we reach the Tengboche Monastery where we spend some time for explore the area and again descend to Debuche to spend the night. Today we pass another village of Pangboche on the way to Pheriche. 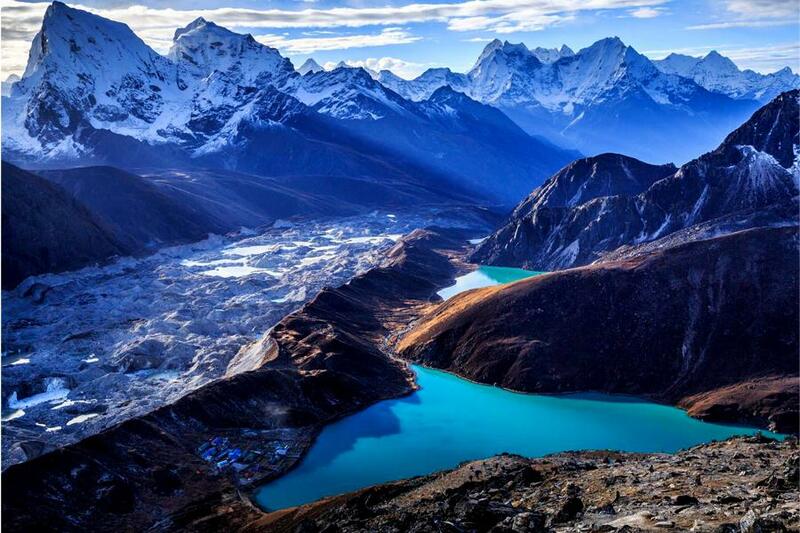 Pangboche is a scenic village surround north by Everest, east with Ama Dablam, Thamserku, and Kangtaiga, south with a range of Kongde and ijma Tse River following through the wild fertile valley. With exploration the Himalaya all on the way, we continue further up towards Pheriche, another beautiful village. Today we again spent whole day time for rest and acclimatization, which help us for adjusting our tired body to adjust to high altitude. However, we make hike rather than idle stand. We climb terrain above the Pheriche village as it is suitable for good hiking experience in cold air, and after the uphill climb to the top, reward with great views of Himalayas will going to the best witness of this trip. After having our breakfast we start to retrace the trails back to Pangboche and cross the bridge over the Dudh Koshi River then we ascend don a trails leading to Ama Dablam Base Camp, the large and open grassland at the foot of Mt. Ama Dablam. Our Guide trains us on peak climbing techniques and the best ways of using climbing gear. We also learn how to use ropes for climbing both up and down. This day boost our confidence and encourage our climbing skills which are so supportive for summiting the mountain. This period of 15 days scales our strength and passion to mountaineering and adventurousness. There is another three camp called 1, 2, and 3 upward the base camp. Ascent from Base camp to Camp 1 is technically challenging and we spend one day at Camp 1. From camp 1 we follow the existing fixed lines and then establish new ones whatever necessary for both ascent and descent. Climb from Camp 2 to 3 is comprised of mixed rock, snow and ice that loose in some certain place. Climb from Camp 3 to the summit is relatively less technical, however, Nepalese Himalaya and mountains are more difficult than of Europe and America with shape and steeply slope. After summiting the mountain, we return back to Base Camp using the rope that is setup already in ascending. We have one day for acclimatization at Camp 1. 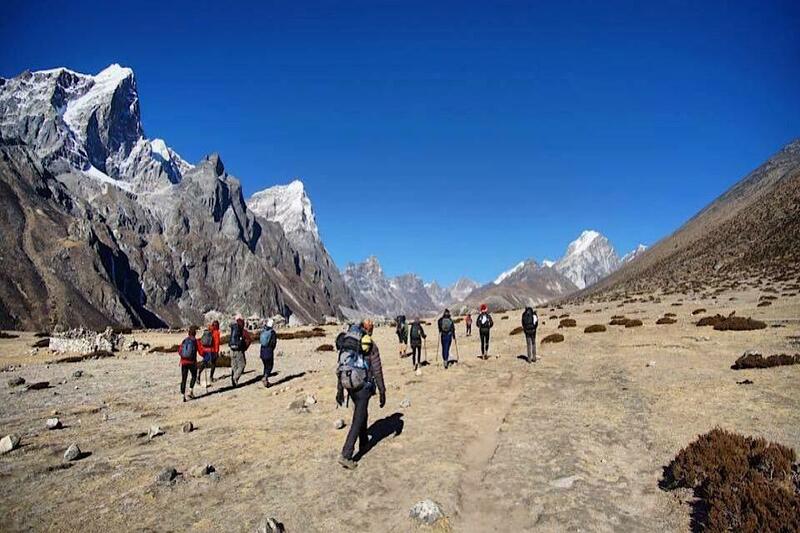 From Ama Dablam Base Camp, we retrace our trails passing through the villages and forests. We arrive in Lukla via Tengboche, Namche Bazaar, and Phakding. From Lukla, we take the earlier flight to Kathmandu. We are going left the wandering mountains and upper altitude behind us after collecting a large amount of experience and evidence. We are returning back with the brave and proud chest with the great and adventurous summit to Amadablam which so difficult and challenging itself. After returning to Kathmandu, we have a grand celebration of great Amadablam Peak. We also have to attend the farewell dinner hosted by Accent Himalaya. This is a reserve day to arrange any possible delay in the Lukla- Kathmandu- Lukla flight. if the flight was held as our schedule, we spend the day enjoy Kathmandu’s delights. If there is some place you visit, we may do that or may do some souvenir shopping. With a month of too much fun and togetherness, the day comes for our separation, our representative will drop you to TIA, before three hours to your flight. We are always with you to any kind of your trip and holidays. We are always there where you want. ©2019 Accent Himalaya Trekking All Rights Reserved.